Giant Food Stores has received Federal Trade Commission approval for its acquisition of five Shop ‘n Save supermarkets from Supervalu Inc.
Carlisle, Pa.-based Giant said Monday that the Shop ‘n Save stores — located in in Smithsburg, Md. ; Greencastle, Pa.; Berryville, Va.; and Hedgesville and Martinsburg, W.Va. — are scheduled to be closed on March 27 at 6 p.m. to begin the conversion to its Martin’s Food Markets banner. All of the locations will undergo extensive remodels and are slated to reopen on April 5 at 8 a.m. Giant announced the purchase of the Shop ‘n Save stores from Supervalu, a subsidiary of United Natural Foods Inc., in early November. Financial terms weren’t disclosed. With the switch to Martin’s, the Shop ‘n Save customers will find low prices on an expanded variety and assortment of local products, including a fresh produce department with more than 300 items, according to Giant. They will also be able to sign up for Martin’s BonusCard loyalty program, which offers weekly promotions and sales, coupons and gas rewards, and have access to the Martin’s mobile app, enabling them to receive personalized digital coupons and set up mobile shopping lists. 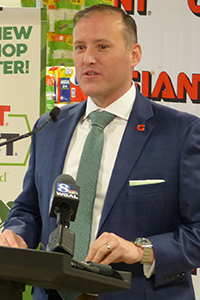 Giant noted that the closing of the Shop ‘n Save acquisition is the latest in a series of strategic investments, primarily in Pennsylvania. Earlier this month, the grocer launched Giant Direct Powered by Peapod, an e-commerce hub in Lancaster, Pa. The company, which has four other e-commerce centers in Pennsylvania, said that banner will become its online grocery brand going forward. Also in February, Giant announced plans to open three more Giant Heirloom Markets in Philadelphia. The urban store format made its debut in the city’s downtown in late January, and the next location is due to open this summer, with all up and running by the year’s end. In addition, new Giant supermarkets are slated to open their doors this year in East Stroudsburg and Walnutport, Pa. In November, the chain also opened a store in Lancaster’s Willow Valley area that was acquired from Darrenkamp’s Markets. Part of Ahold Delhaize USA, Giant operates 171 stores in Pennsylvania, Maryland, Virginia and West Virginia under the Giant Food Stores and Martin’s Food Markets banners.